If you're shooting an AR-15, then more than likely you've already upgraded your trigger or have seriously thought about it. The standard USGI trigger is serviceable, but is very hit or miss and very dependent on manufacturer as far as how good it feels and where it breaks. If you're planning on being a competition shooter (me!) or someone who demands long range accuracy or speed shooting out of your rifle, then maybe it's time to take a look at JP Triggers. I've been skeptical to install a JP trigger in my rifles since I have understood it to be a complex procedure and I've never seen the need for an adjustible trigger. Previously, I've installed Geissele triggers and CMC triggers into my rifles, which essentially just involved installing parts with no adjustment required. The JP EZ trigger is called "EZ" because it's supposed to be just that: "An adjustable trigger that installs easily..." I'll give it that, somewhat. If you've been inside an AR-15 a good bit and have built a few rifles like I have, then you have a good understanding of what a trigger group looks like, how it's supposed to be installed, and the relationship of the safety and pistol grip in a trigger installation. Now, here's the complicated part. 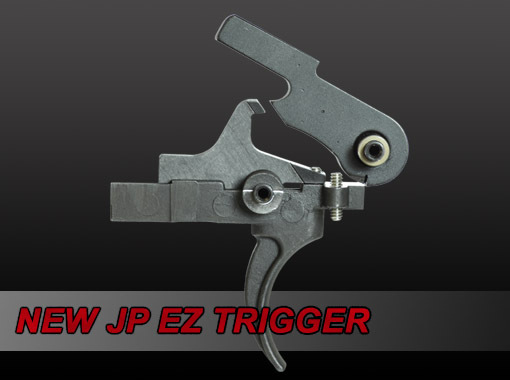 The JP EZ trigger has three adjustment screws that must be tightened to the user's preference during installation. I'll give John Paul at JP credit, he includes excellent instructions and a DVD that you can watch repeatedly to get this part right. And let me stress, YOU HAVE TO GET THIS PART RIGHT! First, you get to choose which hammer spring you want. I went with the red spring (3.5-4.5 pounds pull) since it was described as being reliable with all primers, including hard military 5.56 primers. This being my competition gun and shooting a variety of ammo, I don't want any light strikes. The other spring included is the JP Yellow hammer spring. It was described as being 3-3.5 pounds and possibly too light for hard military primers. This was a no-brainer for me. You can see the tip of the disconnector screw at the very front of the disconnector. The frontmost screw is the overtravel adjustment screw. Second, after I installed the trigger, disconnector, and hammer, I had to adjust the disconnector screw. When you first put the trigger group it, the hammer will not release when you pull the trigger because the disconnector will be too far forward and won't let go of the hammer. Tightening the screw moves the disconnector toward the rear of the rifle and eventually you will hit the "sweet spot" where the disconnector will release the hammer when you reset the trigger after a shot. For me, this sweet spot was with two turns of the screw still showing out of the top of the disconnector. I tested the trigger pull repeatedly before removing the screw and putting the supplied red loc-tite on it. Let me again stress, test this first before you put loc-tite on it. And yes, definitely put loc-tite on it. This is not a part that you want to move as it may make your trigger inoperable or unsafe. After I was finished with the disconnector screw, the hardest part was over. The overtravel adjustment was really easy. I just grabbed another rifle and pulled the trigger to get a feel for normal overtravel on my other triggers, and then I matched the feel on this lower. I then removed the screw and put red loc-tite on it just like I did on the disconnector adjustment screw. Next, I had to put the locking screw in the safety. The EZ trigger comes with a special safety mechanism that is designed to lock against the trigger group and prevent it from migrating. I installed this actually first of all, but it was pretty standard so I didn't go into any detail here. I tightened the screw all the way down as per the instructions and loc-tited it. Last, I inserted the brass retaining nut into the barrel of the safety mechanism and tightened it down all the way as per the instructions. There was no adjustment in either of these pieces. Last, I installed the safety selector lever on the left side of the lower like any standard lever. This concluded installation. Next I functioned checked all part of the trigger group and safety with my upper and lower re-assembled. Total time for this install was about 30 minutes, and that includes some time watching the DVD. Overall, this trigger feels AMAZING. Granted, I have just dry fired it about a hundred times due to inability to get to the range, but it blows my other triggers away. I have always known JP triggers to be top-tier, but have been scared of their complexity. The EZ trigger was not that bad to install if you have a working knowledge of AR-15's. I won't say that installation of this trigger is for a beginner, but builders can do this in an hour if they take their time and do it right. Look for a full installation video to come on the Strongside Youtube Channel and well as some range time when I test its reliability and functionality. You can get the JP EZ trigger HERE.